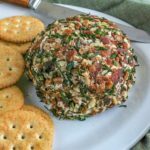 Bacon and Chive Cheeseball is a simple but delicious make ahead appetizer that is perfect for you next party or tailgate! 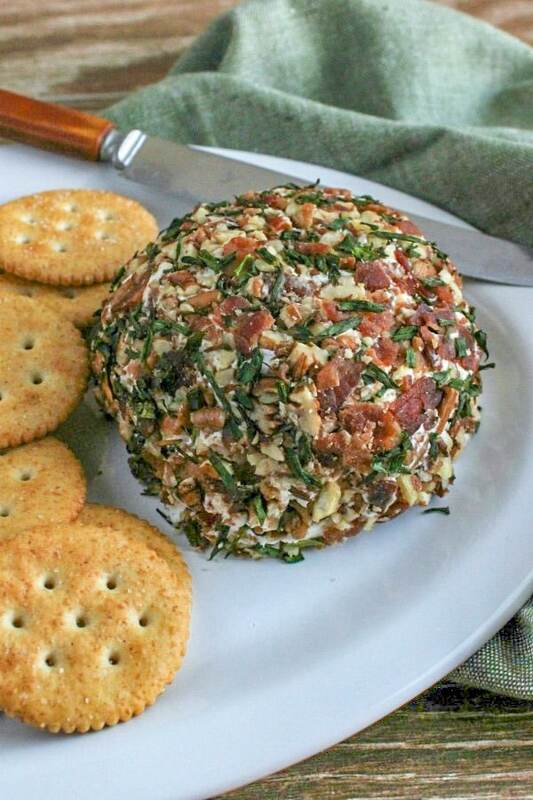 I made this Bacon and Chive Cheese Ball as an appetizer last year when we hosted my husband’s family for our annual Christmas get together. It a big hit and even the plate was scraped clean by the time dinner was served. A couple days later my sister-in-law called me asking for the recipe to that great bacon cheese ball. I don[t know about you but I think when someone asks you for a copy of a recipe it’s the ultimate compliment. It means that what you’ve made is so delicious they want to enjoy it again! Now you might have noticed that one of the ingredients in this recipe is bacon. If you’re looking for an easy way to prepare bacon check out my how to cook bacon in the oven tutorial. This appetizer is easy to make and can even be made in advance and stored in the refrigerator overnight. This is perfect if you’re having guests because it will save you time in the kitchen the day of the party. To make this Bacon and Chive Cheeseball begin by combining one block of softened cream cheese with bacon, chives, garlic powder and pecans. Next, empty the contents of the bowl onto wax paper and shape it into a ball or log shape. Then place the cheese ball in the refrigerator for 30 minutes to harden. Now it’s time to put on the finishing touches. 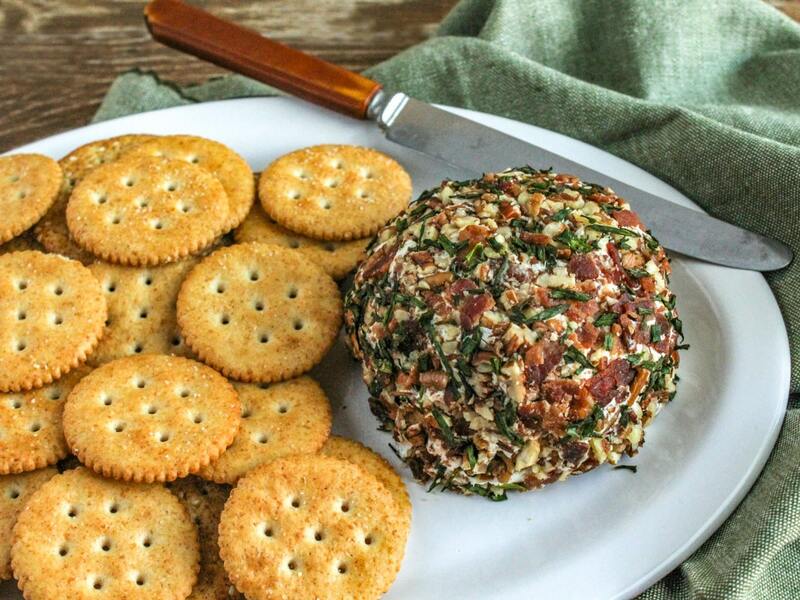 Roll the cheeseball in bacon, chives and pecans. Then, either serve immediately or wrap in saran wrap and foil and keep in the fridge for up to three days. 1) Making this cheeseball in advance for a party? Wrap tightly it first in plastic wrap and then in aluminum foil to prevent the cheese from losing it shape becoming soggy. 2) If you are making this cheeseball in advance and plan to store if in the fridge wait unit just before serving to roll it in the nuts. This will prevent the nuts from becoming soggy and losing their crunch. 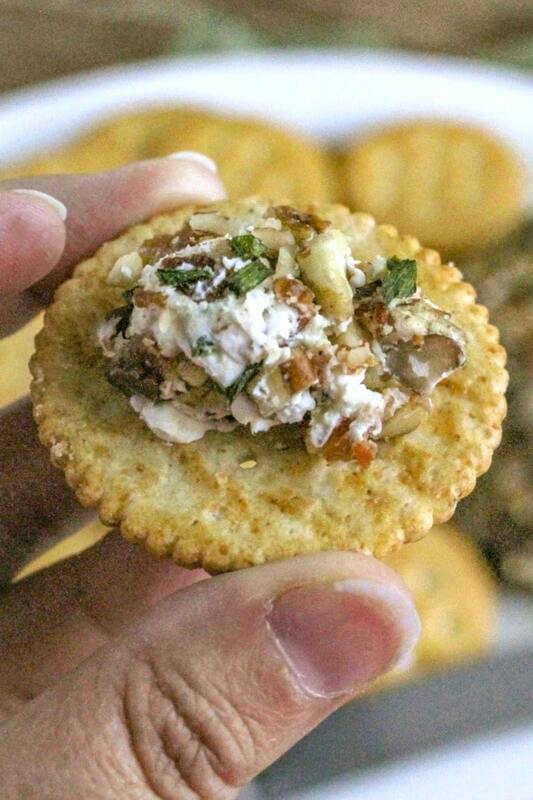 That’s all there is to making this simple but delicious appetizer. You can serve this cheeseball on a platter with a few crackers or you can include it on a cheese tray as a savory addition. 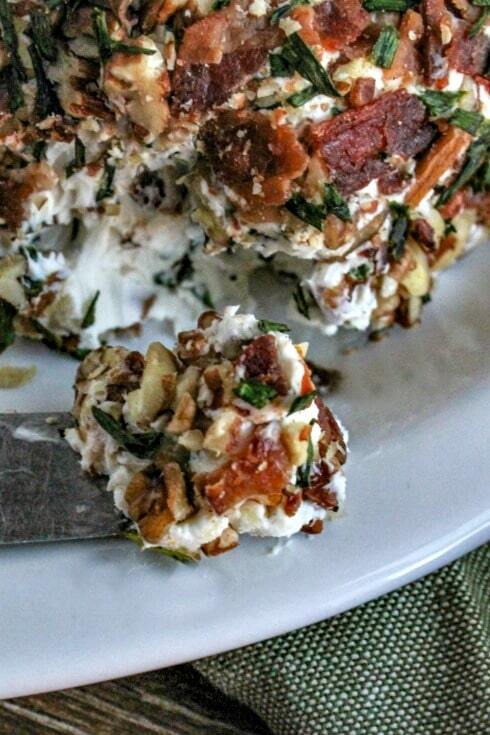 No matter how you decide to serve it this Bacon Chive Cheeseball is going to be a hit with everyone! Looking for more crowd pleasing appetizers? Let’s connect follow me on: Instagram, Facebook or Pinterest! See my tips for this recipe in the post above.